RS MaxPatch is now available from HammerHead Trenchless Equipment. RS MaxPatch is a fast, trenchless, selective point repair system for pipes 3 to 48 inches in diameter. Jeff Urbanski, RS Technik’s national sales manager, said RS MaxPatch gives contractors two benefits over other point-repair systems on the market – a long working time with a short cure time. Working time of ambient-cure silicate resins is much longer than that of thermosetting polymers. 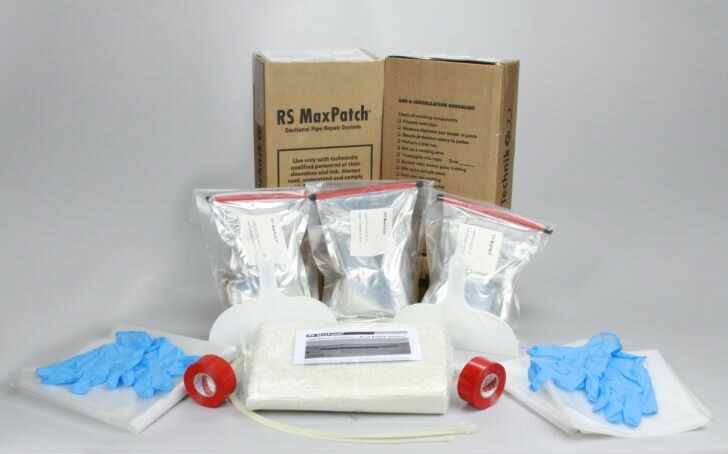 And RS MaxPatch has the longest working time of any silicate-based resin offered by similar kits on the market. Additionally, use of RS MaxPatch allows for an ambient cure, as heat cure or other accelerators are not required for optimal performance. Although new to the list of products available through HammerHead, RS Technik’s authorized dealer in North America, RS MaxPatch has proven itself around the world in the 12 years since its introduction. It is appropriate for use with a wide variety of pipe material including concrete, reinforced concrete, vitrified clay, PVC and asbestos cement. The composite RS MaxPatch system consists of a specially designed glass-reinforced fabric and two-part ambient-cure silicate resin mixture. Engineered as a high-performance system exceeding the structural requirements of ASTM F1216, RS MaxPatch is the ideal cost-effective, environmentally friendly CIPP point or sectional repair solution for all sewer and storm water pipes having a circular or oval cross section. RS MaxPatch resin is odor-free, styrene-free, VOC-free and presents no hazards to the environment or human health. Resins cure under ambient sewer conditions with very low shrinkage, even under water. The silicate-based resin keeps well in its storage containers without risk of leakage, and a three-year shelf life ensures that infrastructure agencies and municipalities will be able to stock RS MaxPatch inventory on site without undue concern over short expiration. Graphical representation of RS MaxPatch in the ground during an installation.